That sums up the basic dynamic on the Hill at this point. Congress and the White House have until midnight Friday to agree on some sort of spending bill to keep the government funded. Otherwise, 800,000 federal employees get sent home, national parks close, financial oversight lapses, and basic services get disrupted. And, at this point, the deal over spending—assuming there is one—is getting thrashed out behind closed doors, between President Obama, Reid, and Boehner. Which means no one else in Congress has all that much to do. Except, that is, to try to get attention. Not to be outdone, Republicans spent all day firing back with their own ploys. Early in the day, Defense Secretary Robert Gates told soldiers in Baghdad that their paychecks would be delayed for at least a week in the event of a government shutdown. “You all know as well as I do that a lot of these troops live pretty much paycheck to paycheck,” Gates told The New York Times. 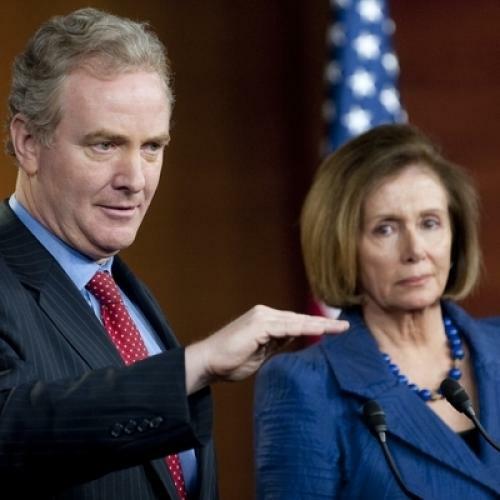 The House Democratic response effectively amounted to one word: Seriously? As Pelosi and Van Hollen were walking out of their morning press conference, a reporter asked if they were worried about being seen as anti-military by opposing the bill. Pelosi strode back up to the podium, unamused. “By the way,” she noted, “in our bill last year to fund the troops, they voted against it. So they have—and some might use harsher words here—an inconsistency.” She’s right. Neither party is innocent of trying to tack on their preferred policies to military-spending bills and then daring the other side to vote against solider pay. It’s an old trick in Congress—and one that’s so transparently cynical that it never works. For their part, Senate Democratic leaders—the ones who are actually negotiating with Boehner and the rest of the House GOP—have remained largely unaffected by all the mayhem on the House floor. New York Democrat Chuck Schumer scoffed at the troop bill: “No one took it as a serious offer.” The Senate Dem line all day was that they’re close to an agreement with Boehner on the amount of federal spending to cut for the rest of the fiscal this year—somewhere in the vicinity of $33 billion to $39 billion. The real hold-up, they claimed, is Boehner’s insistence on riders to the bill—things like ending funding for Planned Parenthood or preventing the EPA from addressing global warming. “The Tea Party’s trying to push its extreme agenda with issues that have nothing, nothing, nothing to do with funding government,” said Harry Reid. Usually, his whispery voice can barely be heard over the scratching of pens on notepads around him, but this time, he was nearly on the verge of shouting. Boehner, meanwhile, seemed unruffled. At a mid-day press conference, he stepped out to a frenzy of clicking cameras and smiles. “All you reporters here, do you wonder with all these photographers how many pictures of me in a suit they need?” If he was tired from haggling all Wednesday night with Reid and Obama, it didn’t show. Nor did he seem outwardly uneasy at having to navigate between two unpalatable outcomes: If there is a government shutdown, Republicans will likely get blamed, as they did in 1996. On the other hand, if Boehner compromises too soon, he risks a revolt from within his own caucus. The one Republican who seems to be aware of the faintly absurd nature of all the shutdown theatrics was Boehner himself. One haggard reporter told the Speaker that, for three days in a row now, every day had started with lots of bluster from various politicians, and then ended with a nighttime meeting of Boehner, Reid, and Obama where slow progress over a spending bill got made. “I‘m glad you recounted that history for me,” Boehner chuckled. “Look, we do public policy here in Washington. But we do it in a political setting. This is what makes America a little different from every country in the world.” And, with that, he was off, back to yet another closed-door meeting, as the Friday deadline inched closer.